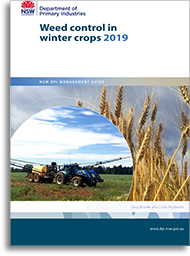 Good weed control management in winter crops is a vital part of successful and profitable crop production. Yield losses caused by weeds can vary enormously from being almost negligible to a complete loss. Weeds lower crop yields by competing for soil moisture, nutrients, space and light and can carry diseases which attack crops. This competition reduces grain yield and quality, and can impede harvesting. Some weeds can restrict cropping options as herbicides for control are sometimes limited. Thoroughly investigate which weed species are likely to germinate in a paddock before sowing crops with limited herbicide control options. Weed control is a numbers game. Growers should aim to reduce numbers and keep them low with an ongoing program. An integrated weed management system combining all the available methods is the key to successful weed control.